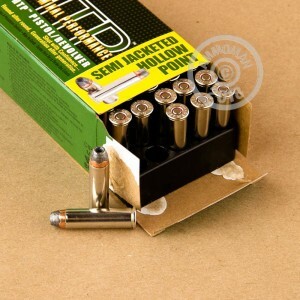 This 500 round case of 357 Magnum ammo is a great choice for a defensive load. 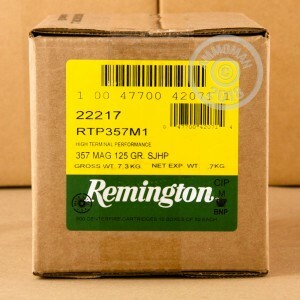 This Remington's HTP load features a hard hitting semi-jacketed hollow point projectile designed to expand on impact helping to quickly stop any would be assailant in their tracks. Each case contains 10 boxes of 50 rounds each. As a kid my dad was a police officer and the department used this 357 ammo in the service revolvers. They used it as to not over penetrate but I always wondered with this stuff being so hot, how does it not over penetrate. Well as a science fair project for my son we shot (2) blocks of modeling clay. One was shot with a 38 special from Winchester and was defense ammo out of a 4" Ruger GP100 and the other block from the same gun but with this 357 round at about 10 yards. The 38 made a baseball sized hole in the 1x1x1 clay block with a void of about a baseball size hole internally and passed completely through. This 357 though opened up the clay with a hole large enough to stick my head in, and actually splattered red clay on my forehead with a very pronounced sting leaving redness when I pulled the clay away. The round did not pass through the other side but rather fractured out. This round would run anyone's day no matter where they got shot. 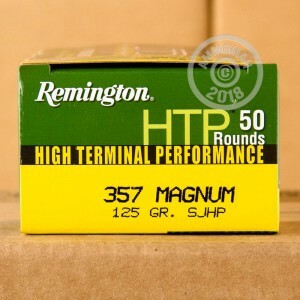 This is the only defense round I would use in a 357.